I utterly adore Mint Aero Bubbles. Like, if someone gave me the bag, I would happily finish it within minutes (and thats being slow). My No-Bake Mint Aero Cheesecake recipe that I posted recently made me realise that you all utterly adore the delicious treat too! 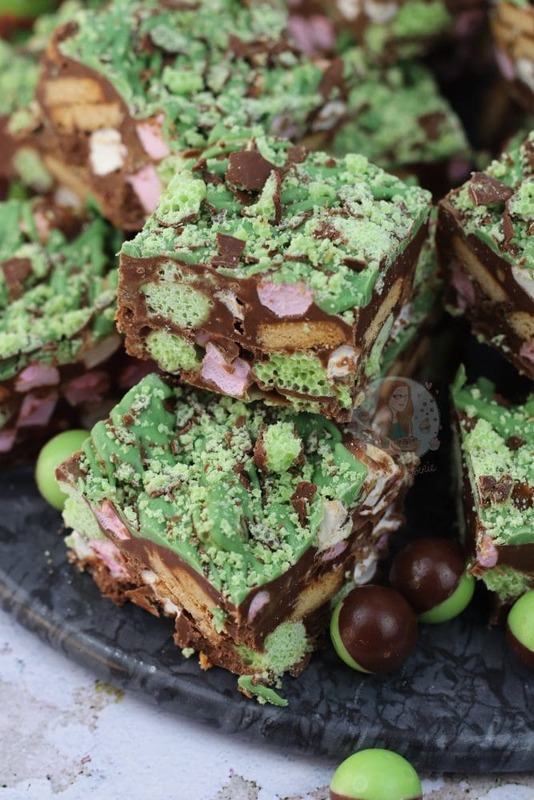 Therefore, another Mint Aero related recipe simply HAD to happen. 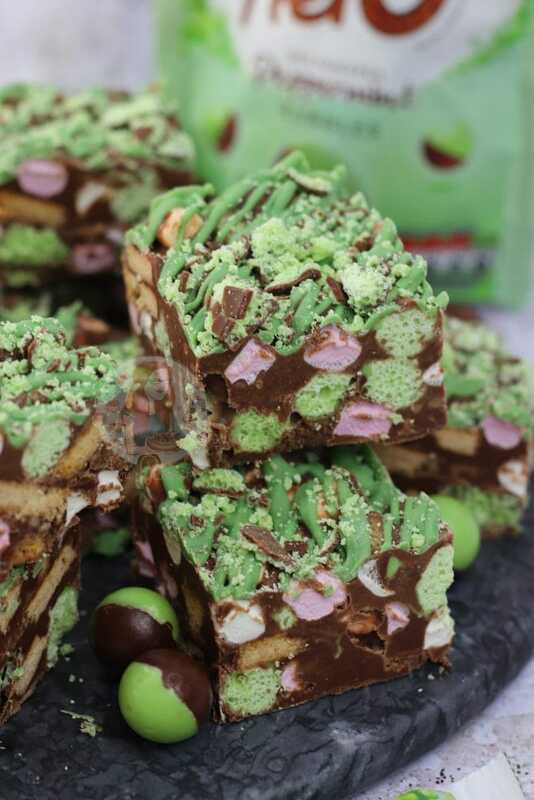 Hello, Mint Aero Slice. I wasn’t entirely sure what to name this as I use the same chocolate mix as my Rocky Road recipes with the Chocolate, Butter, and Syrup and this is purely because I much prefer the taste of it compared to using just melted chocolate. I find it easier to eat as its not as solid, and it just tastes so delicious. As I already have my recipe for my Mint Slice on here, which is a mix of a Biscuit Base, a Peppermint Creme, and Chocolate.. I couldn’t call it that. I’ve finally remade this recipe after nearly two years of forgetting to have put marshmallows in the first time, so thats all that is different in this updated version! 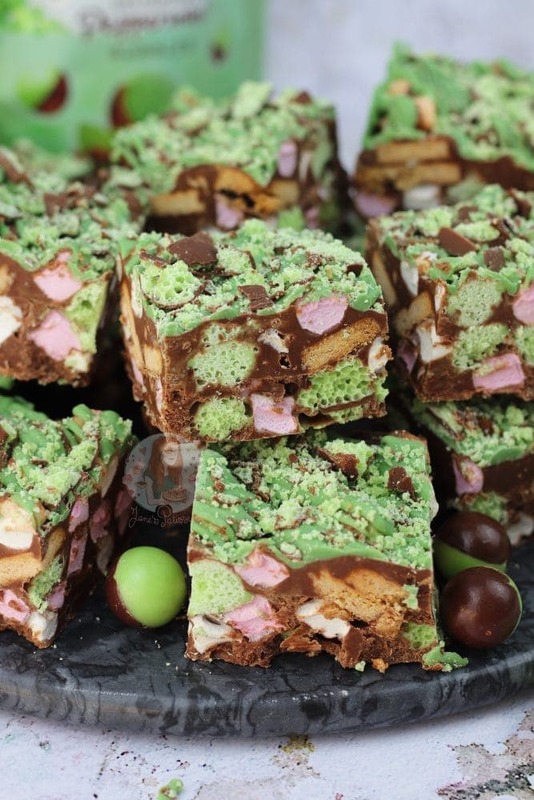 Honestly this recipe is such a crowd pleaser whether it has marshmallows in or not, so its down to you if you include them! Luckily, its easily adaptable. I decided to make this treat on the Hottest Day of the Year so far which might have been a mistake, but it was so quick and easy to make it didn’t really matter. My Chocolate mix was just quite soupy is all! It still set perfectly fine after being in the fridge over night and it still tasted perfect. I do recommend (as noted in the method) to leave the chocolate mixture to cool slightly, especially if you have melted it over a Double Boiler which I prefer using anyway. This is to prevent the Mint Aero Bubbles from completely melting into the mix, as I like seeing them and having the chunks of them throughout! I did add in some digestives to this treat as well, as I like having the crunch and something slightly less sweet, but you can easily use any biscuit you please! If you don’t like Mint, you can 100% use the normal Aero Bubbles, or swap it to a chocolate treat of your choice. 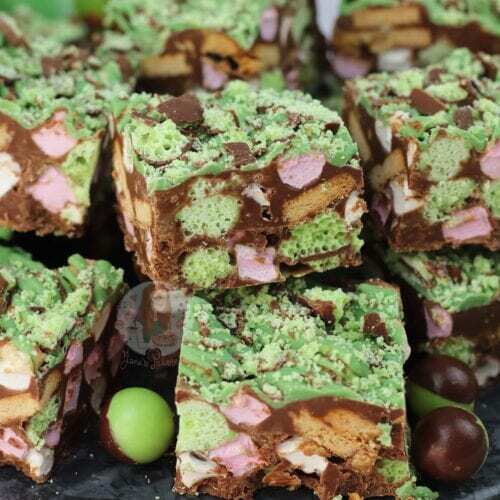 However, I couldn’t love Mint Aero anymore than I already do, so this is already one of my favourite recipes. I decided to drizzle mine in a mint colouring white chocolate drizzle as I wanted it to actually look minty, and this allowed me to stick extra Aero bits to the top! I honestly utterly adore this simple yet delicious No-Bake Treat, and I know you all will too! Enjoy! Line a 9×9″ Square tin with Parchment paper and leave to the side. In a Large bowl, add in the Chocolate, Golden Syrup, and Butter – melt on a low heat over a Double Boiler, or in the Microwave on low, in short bursts until fully melted – stir till smooth! Alternatively, add the syrup and butter to a pan and melt. Add in the chocolate (off heat) and stir till combined and the chocolate is melted. Once its melted and combined wait 3-5 minutes for the chocolate mix to cool a little. Add in the chopped biscuits, mini marshmallows, and Aero Bubbles and quickly fold together – pour into the tin and spread so its even and refrigerate until set. Melt the White Chocolate on short bursts in a microwave, or over a double boiler until melted. 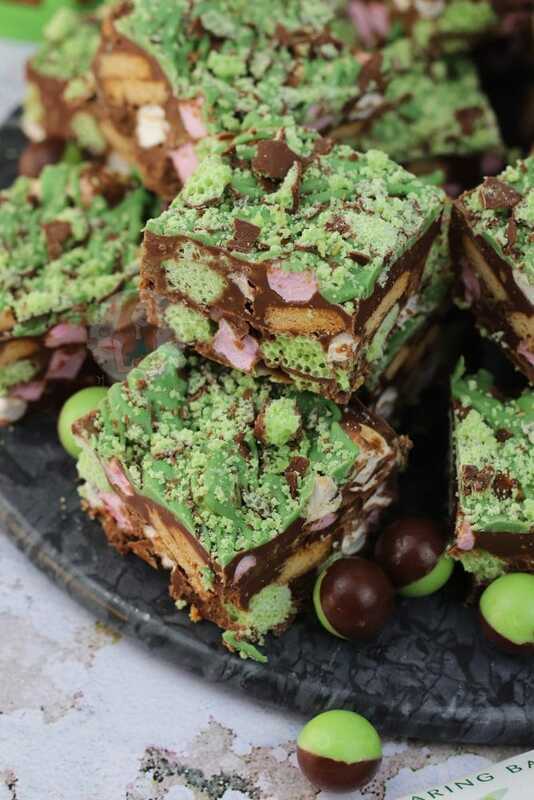 Add in a bit of green food colouring to get a ‘minty’ colour and drizzle it all over the traybake. 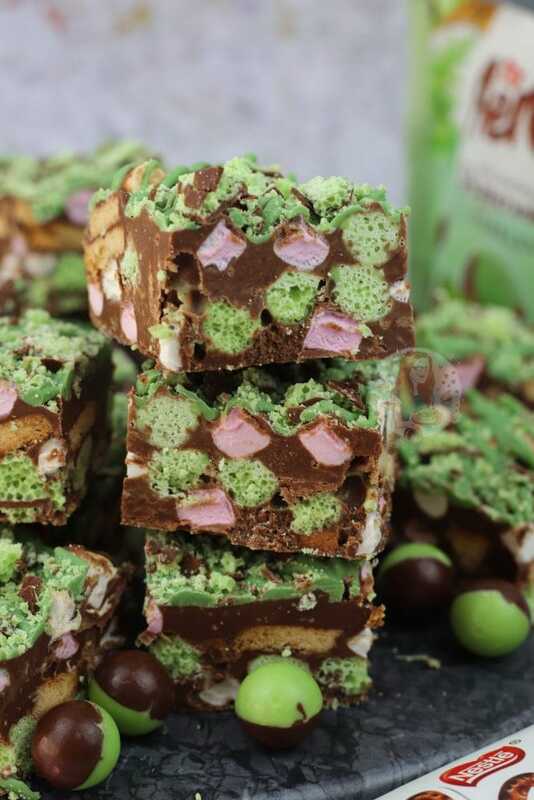 Sprinkle on the crushed Mint Aero pieces so they stick and refrigerate again till set. Chop up the pieces into either 4×4 for 16 larger pieces, or 5×5 for 25 smaller pieces. Enjoy! I really would recommend using just Milk or Dark Chocolate for the base of this recipe as it melts better than White Chocolate. The White Chocolate might mix/split when mixing it with the Golden Syrup or Butter, which I have had happen to me several times! I often use either Cadburys Milk Chocolate or Callebaut Milk Chocolate – I find the flavour works best and its delicious! Even supermarket own chocolate works well! This recipe will last in the fridge for up to two weeks, IF it happens to last that long! Older Next post: Terry’s Chocolate Orange Fudge! Newer Previous post: Caramac Fudge! Thanks so much for your amazing recipes on this site ! 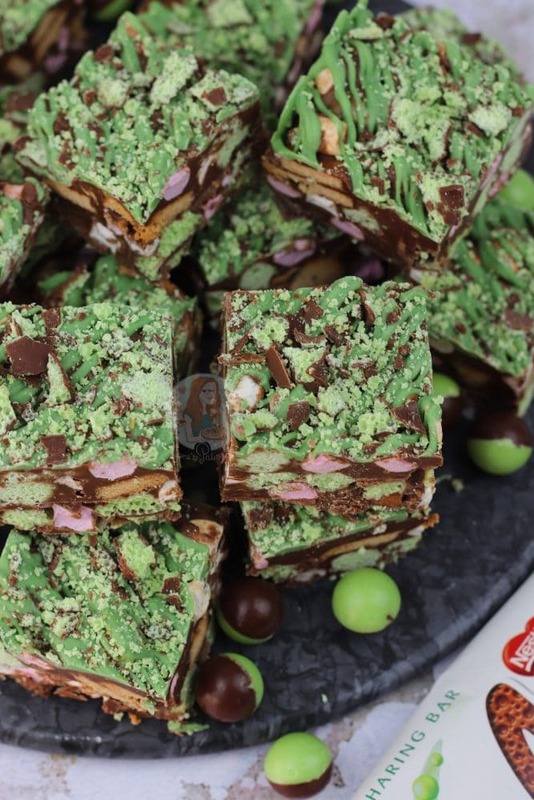 I’ve just made the mint Aero rocky road & despite a ‘blip’ with the green food colouring making the melted white chocolate go quite stiff, we loved the finished result !!! 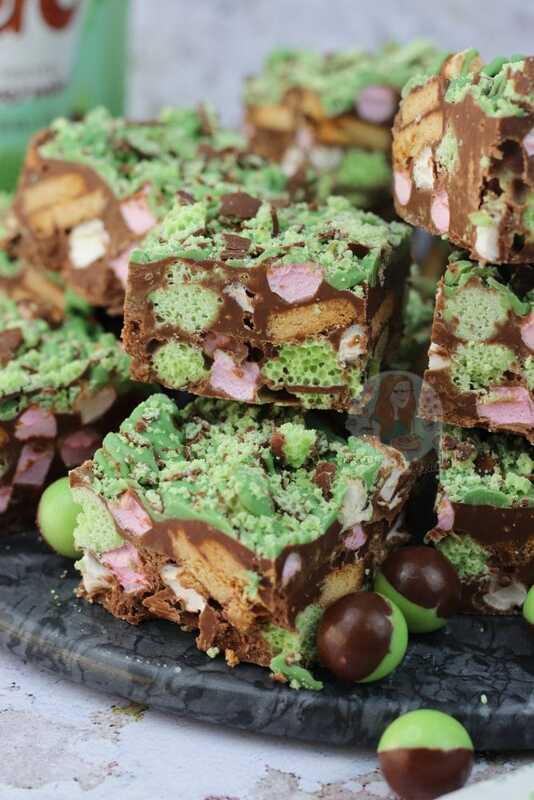 I’ve also previously made your Rolo rocky road, which is my favourite ! Looking forward to trying lots more of your recipes in the coming weeks / months 🙂 – I’m thinking of making a cheesecake for Christmas, but not sure which one, as they all sound amazing ! I absolutely love your recipes and I know it must be something that I am doing wrong but I Have tried this recipe 5 times now without success just can’t get the chocolate to blend in with syrup and butter without spliting, I’ve tried different chocolates, melting in microwave, in a Bain Marie, have tried melting separately and then adding together when cooled down slightly but nothing works don’t know what I am doing wrong. Oh no! I am so sorry you’re having a problem with the rocky road! Have you done melting the syrup and butter till hot, and add in finely chopped chocolate? That’s the best one I can recommend! Ooo yum I used to love aero bars as a kid, this looks so tasty as well! Its a heatproof bowl, above a pan of boiling water. Its worth a google. I love this recipe, tastes so yummy. Are you able to freeze it? This is so nice, thank you. Just wondering though – can you freeze it? Depending on the ingredients, it can need much less heat as sometimes its all other stuff. Try heating the syrup and butter together, take it off the heat, and then put the chocolate in finely chopped and stir together. As little stiring as possible as well. What are digestives? When I hear digestives I think Tums or Enzymes. I am confused here. Thanks for your help. They’re a biscuit. Google for your alternative. Wow, just made this and it’s the BEST THING EVER!!! Can’t wait to try out more recipes from your site, thanks so much! Absolutely delicious! I have… ahem… made it twice in the last week – to share, I should clarify, though I could happily have scoffed the whole lot myself! This was absolutely scrumptious! Thank you! Couldnt wait for it to set completely to sample! Hiya – your chocolate mixture was far too hot then still if it melted the aero. You need to fold it through in as small amounts as possible to prevent melting entirely. If they did melt, that would be why the mixture was so runny. I’m sure it’ll still taste lovely! Yes obviously the chocolate was too hot, but I did wait well over 5 minutes for it to cool. Maybe you’re recipe needs a slight tweek to explain potential issues and that you should add the biscuit first a little at a time?. No one else has had this issue, and your chocolate could have been particularly hot by chance so it’s not a recipe error. ? I personally would chuck it, chances are the chocolate has got too hot or some water got into it and both are killers for chocolate. Yes I too have had this trouble and now tried it twice! It seems that adding the butter and syrup in with the melting chocolate makes it split? Melting the chocolate alone has no problems. Not sure why? Try it where you heat the Butter and Syrup and melt them together, and then add the chocolate. Some people have troubles with it as they have the heat on too high, if you do it in this order, it can prevent it. Hi, I’m currently in the process of making this now! How long does it normally take for the base to set? Can take a few hours to set fully in the fridge!